Mounting concerns on both sides of the border are prompting the U.S. and Canadian ambassadors to meet with businesses in the wake of a new trade deal between the United States, Mexico and Canada. In an interview with CBC Radio's The House, U.S. 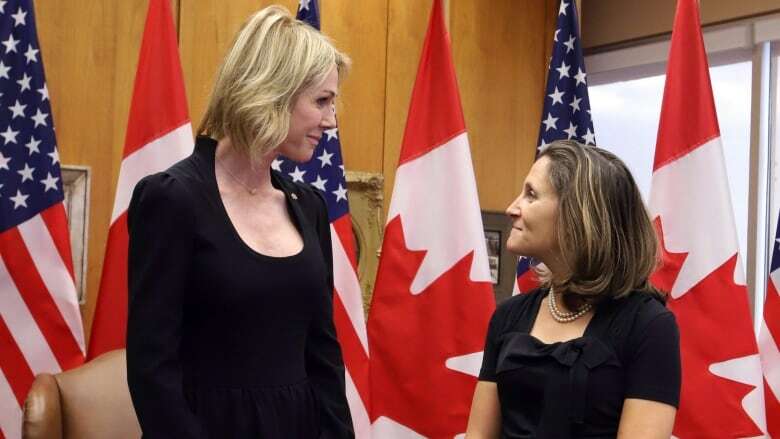 Ambassador Kelly Craft said she and her Canadian counterpart, David MacNaughton, will embark on a series of town hall meetings to assuage fears from investors over the USMCA. Craft also relayed a message for Canadians. "I understand your frustrations," she said of the fallout from sometimes fractious trade talks, while standing in the famous University of Kentucky athletics centre named after her coal magnate husband, Joe Craft. The tensions created by the upheaval of the North American Free Trade Agreement and the birth of a new provisional pact (called the USMCA by U.S. President Donald Trump) have ignited uncertainty among investors. Craft explained she and MacNaughton will travel around Canada and the U.S. speaking to cross-border industries and small businesses about the USMCA in an attempt to let them know the governments are listening. The current plan is for two meetings each month, starting in December. Touted as a solid deal for Canada by Trudeau government officials, Trump also hailed the USMCA as a big win for the new era of "America First." While both governments sort out the details and look for ways to use the deal to beef up their eventual re-election campaigns, businesses are still confused by what this means for them. The USMCA still is not a "done deal," said Ed Webb, the president and CEO of the World Trade Centre Kentucky. "It's not finished yet." Canada is Kentucky's largest foreign trading partner, with exports totalling almost $8 billion a year — more than the state's next two largest partners combined. But many investments have been halted until the new trade deal comes into effect and stability is re-established. That's frustrating businesses in Kentucky — and beyond. The state was also carefully targeted with retaliatory tariffs on products such as steel, playing cards and bourbon after Trump's spring announcement that Canada would be subject to steel and aluminum tariffs. Imposed by the U.S. administration on national security grounds, steel and aluminum tariffs became intertwined with the NAFTA negotiations, but Canadian officials failed to secure an exemption in the new text of the USMCA. For the ambassador, it's about playing the long game. "We need to be patient, we need to trust this will change," she said. "The tariffs will at one point lessen." It's not just the retaliatory tariffs Kentucky is concerned about. As in Canada, the possibility of a future bite from 25 per cent tariffs on autos is a staggering thought for the car industry in the Blue Grass state, which swaps millions of vehicles and parts across the northern border every year. "We're definitely concerned about how it affects our business with Canada," Bruce Breitholle, the vice president of business operations at ATech, a company that builds training modules for auto manufacturers, told The House. That concern was so overwhelming that it overtook the conversation at a business dinner Breitholle attended at the Kentucky Governor's residence last month. The discussion quickly shifted to reassuring the Canadian attendees there was no animosity and that the Canadian market is a keystone of life in the southern state. ATech's anxieties confirm the fears of Janet Harrah, a trade professor at Northern Kentucky University. She explained business is up in the state, but much of the growth is likely just inventory that was built up in anticipation of long-lasting tariffs — and that will harm Kentucky. "If the cost of doing business here gets too high, people go somewhere else to do business," she said. Though the president has given Canada an exemption on auto tariffs — for now — it doesn't come without conditions. If the U.S. moves forward with the imposition of worldwide Section 232 national security tariffs on autos, those would also apply to Canada. Ottawa has effectively scored a temporary exemption, because Canada would still be able to export cars and parts tariff-free up to a certain amount well above what Canada currently sends south of the border. Even if the auto sector escapes punitive tariffs, the remaining steel and aluminum duties will drive up the cost of vehicles. Cars are Kentucky's biggest export to Canada. Auto manufacturing employs nearly 95,000 people in the state, according to the Kentucky Automotive Industry Association. The sting of new auto tariffs would be felt on both sides of the border, as about 130,000 jobs in Canada are based on vehicle manufacturing. As the U.S. leader throws jabs at Canadian officials, some in Kentucky's business community expressed their embarrassment at the president's behaviour. "We don't want to be seen as that big bad country," Breitholle said. "That's the arrogance coming from way at the top." Despite the strain created by more than a year of negotiations, both Webb and Breitholle were optimistic no permanent damage would be dealt to the Canada-U.S. relationship. The economic impacts, however, will be unavoidable. How that trickles down and when those consequences will hit is the next big worry, Webb cautioned. The USMCA still has to be approved by Congress, and ratified by all three North American nations.